Nirapod Bangladesh Songstha aims to: ‘reduce the vulnerability of low income households to environmental hazards such as flooding and strong winds’. We do this through promoting improved house building techniques and environmental initiatives such as tree planting. Our building program is aimed at increasing community self reliance by creating skilled and informed local builders, craftsmen and house owners. There is no need to make major changes in building technology; this should actually be resisted since Bangladesh and many hazard prone countries are littered with failed projects aimed at fundamental change. Instead we will promote tried and tested techniques that build on existing construction practices. We show people why these techniques are important by through practical workshops and use traditional song to reinforce these messages. We build demonstration houses so that people can see and experience our ideas first. Our strong links with learning organisation Housing and Hazards, RedR UK and BRAC University allow us to provide a platform for students and other building professionals to gain first hand experience of low cost building techniques and the challenges facing NGOs on the ground. 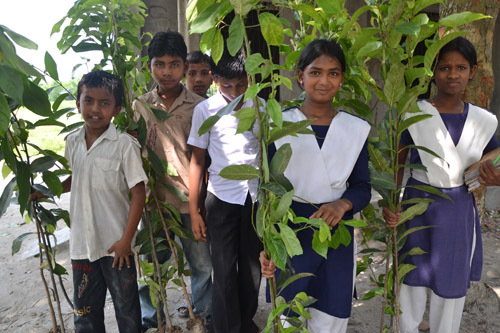 Our environmental work focusses on raising awareness of the importance of a diverse environment and includes tree planting initiatives with local schools and communities. The information on this site sets out the background behind these techniques and the process we will use to disseminate them. Why change traditional house building practice? Every year thousands of homes are decimated across the world. 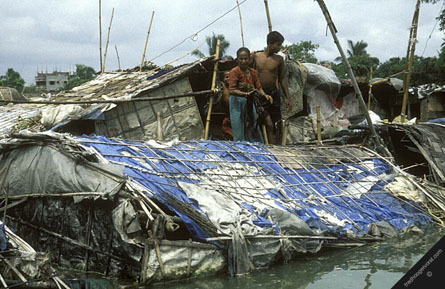 Reports frequently refer to floods, cyclones and earthquakes but these are only part of the problem. The underlying disaster is often the desperate poverty in the rural communities which forces people to live in hazardous locations and in unsuitable housing. Vulnerability to natural hazards can change for a number of reasons. Pressure of population and the need to put more good land to agriculture means that increasing numbers of people must live on riverbanks or in coastal areas where they are more exposed to the vagaries of nature. Another consequence of putting good land to agriculture is that it is often replacing natural construction materials such as bamboo, driving up the price of these resources. A generation ago, people used to be able to freely meet their needs locally in the forests. 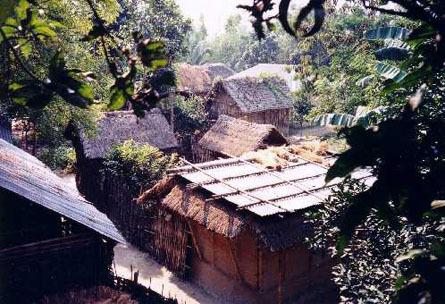 Over 80% of Bangladesh’s houses are in rural areas and three-quarters of those are of either non-masonry or temporary construction. Simple strengthening improvements to these houses can cost just 5% of the total construction cost. 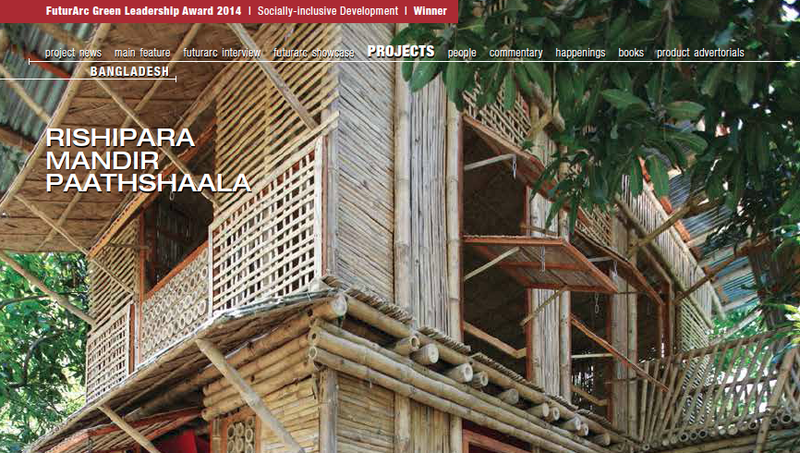 However, many rural homes are self-built which makes the process of disseminating information much more complex. Virtually every family in the country would need to be reached. 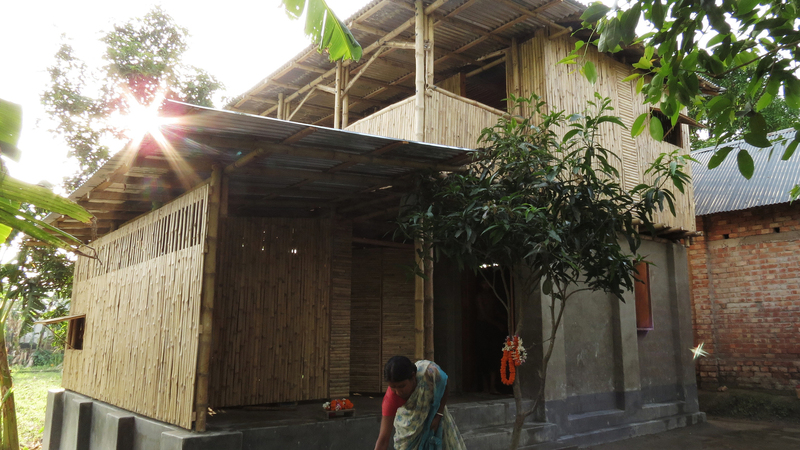 It is within this context that Housing & Hazards, a group of building professionals based around the University of Exeter, set out to explore simple technologies that could give Bangladesh’s non-engineered buildings a measure of resilience against floods and wind. The technologies had to be affordable, appropriate and available in local markets to give millions of people real choices and some control over their lives and livelihoods. Since 1998 they have undertaken a number of projects in Bangladesh aimed at improving communication at the grass-roots level and researching affordable technologies that can be implemented by the local people. It is through this early work that Nirapod Bangladesh Songstha’s founder Azit Roy first became involved in low-cost housing. Having since made a profession in the low-cost housing sector he went on to found Nirapod Bangladesh Songstha in 2009 with support from Housing and Hazards.